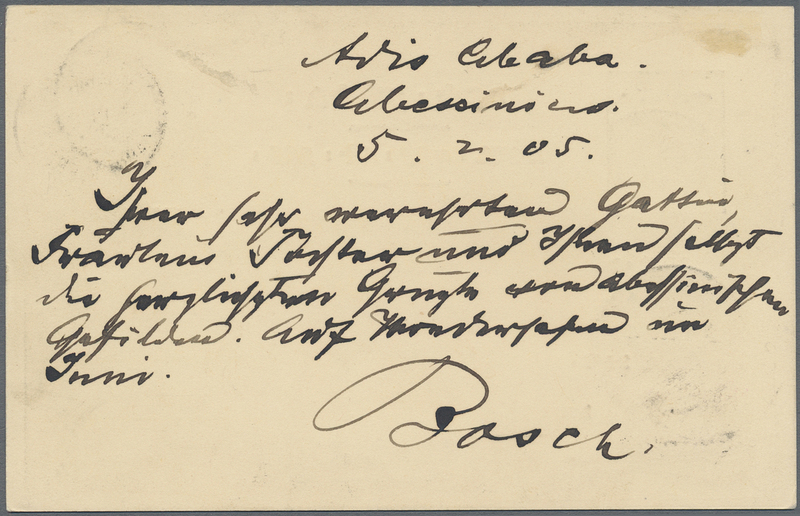 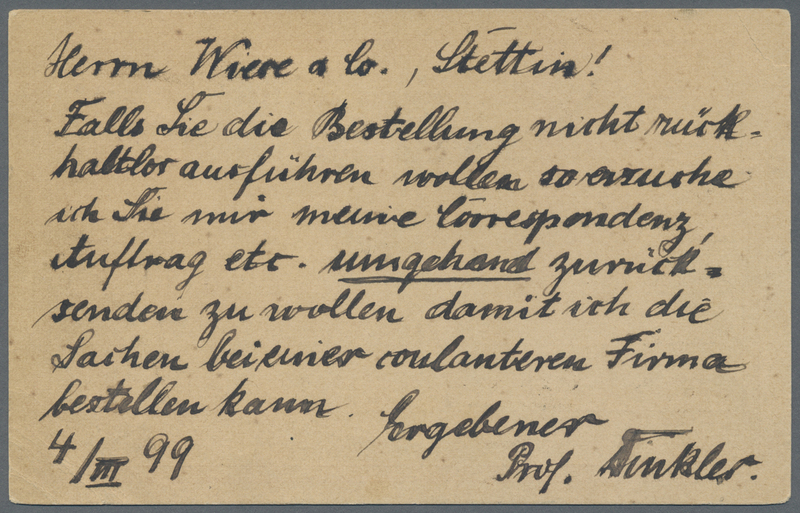 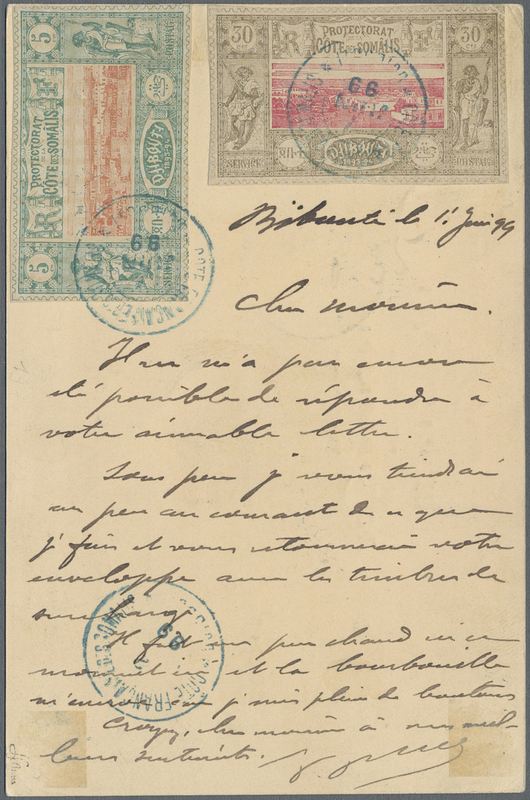 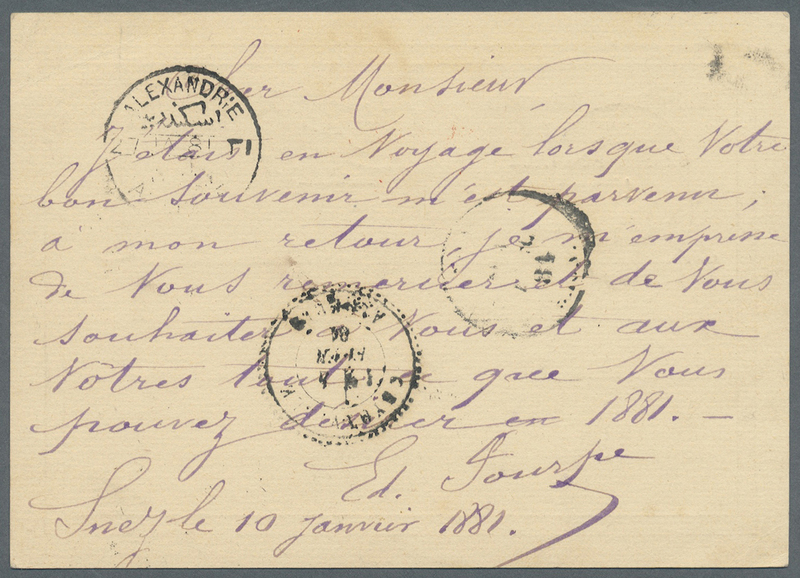 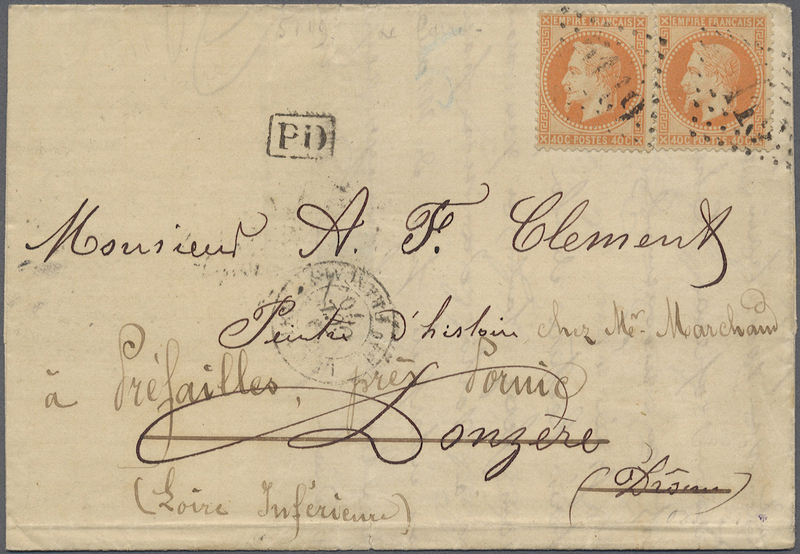 11174 Ganzsache (Complete) 1895, stationery card 3 M. uprated 1 M. (pair) tied french mail steamer "MARSEILLE A LA REUNION 18 OCT 95" posted aboard Oct. 17, to Chalons s. M./France, transits Suez Oct. 18, Alexandria Oct. 19, red french entry marking and arrival "CHALOS 26 OCT 95". 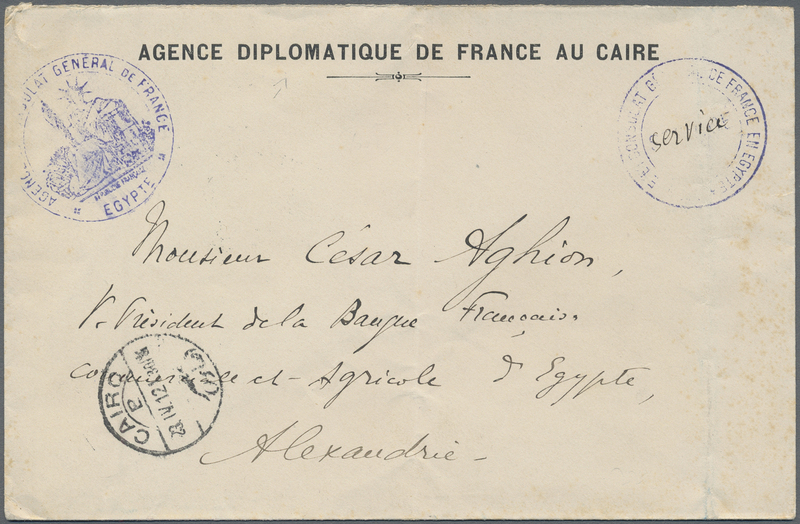 On reverse imprint of "The Egyptian Cigaret Manufactory/Simon Arzt, Manager/Port-Said, Egypt" with text on senders travel from Marseilles by the mail steamer and about 400 passengers aboard and his proposed arrival at Majunga (Madagascar). 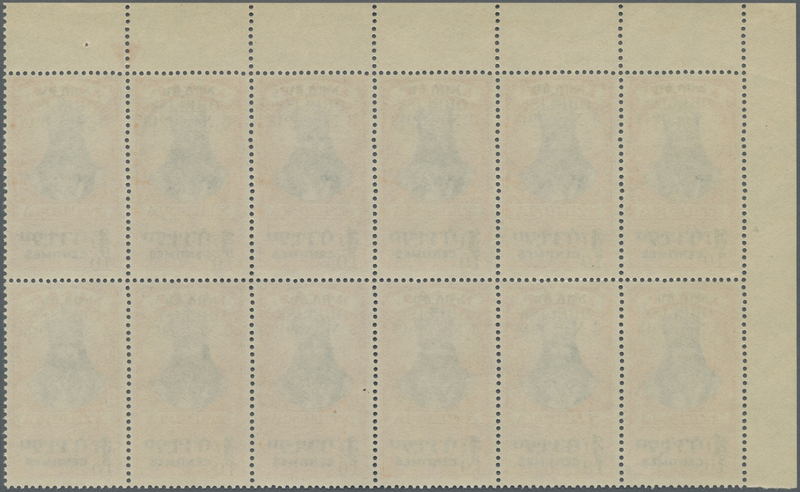 Vertical crease, amazing item. 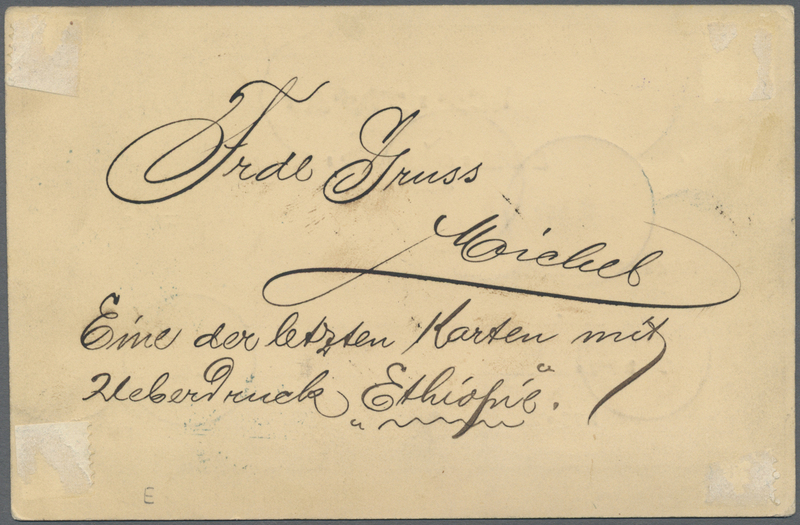 11175 Ganzsache (Complete) 34 + H&G 3 1899 Postal stationery card 5m. 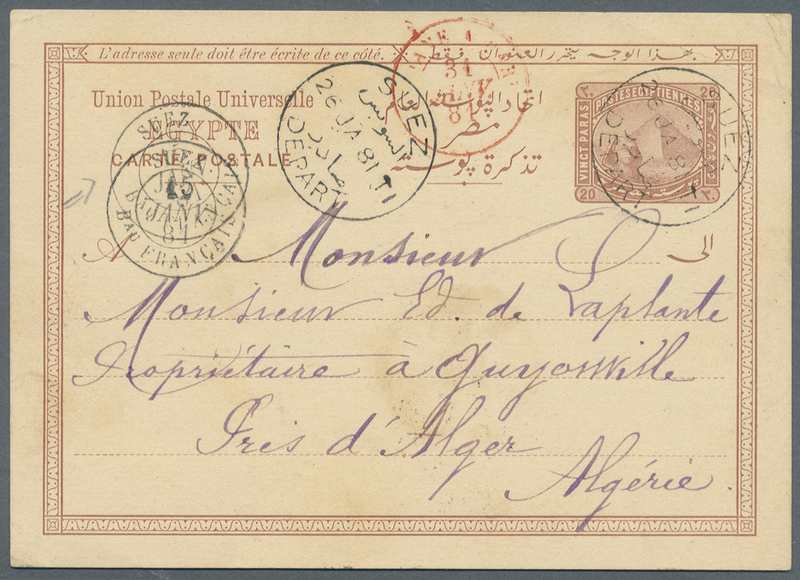 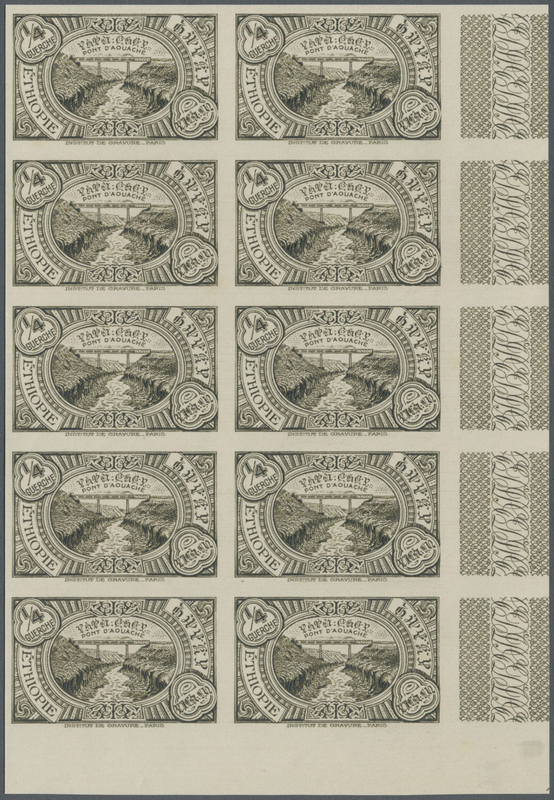 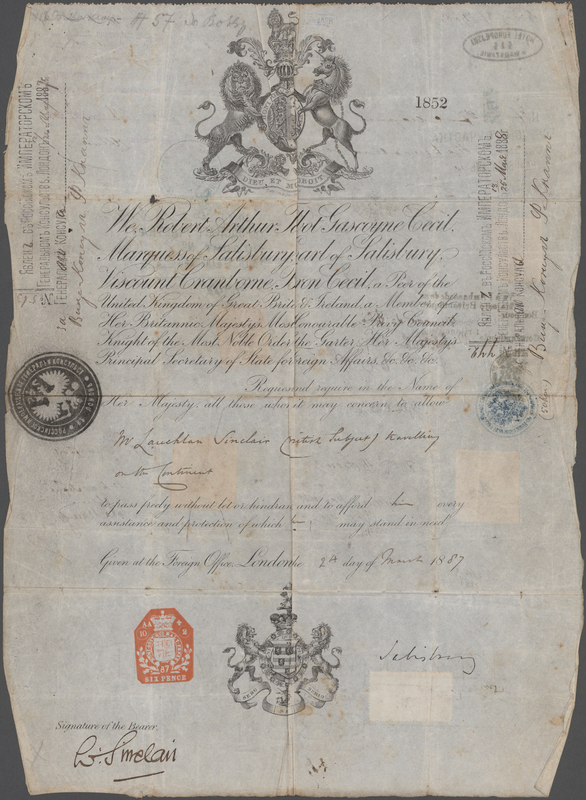 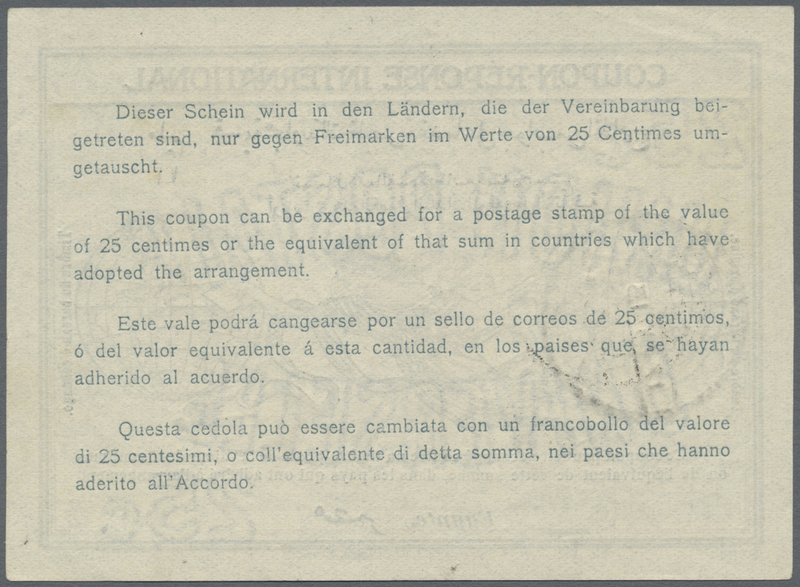 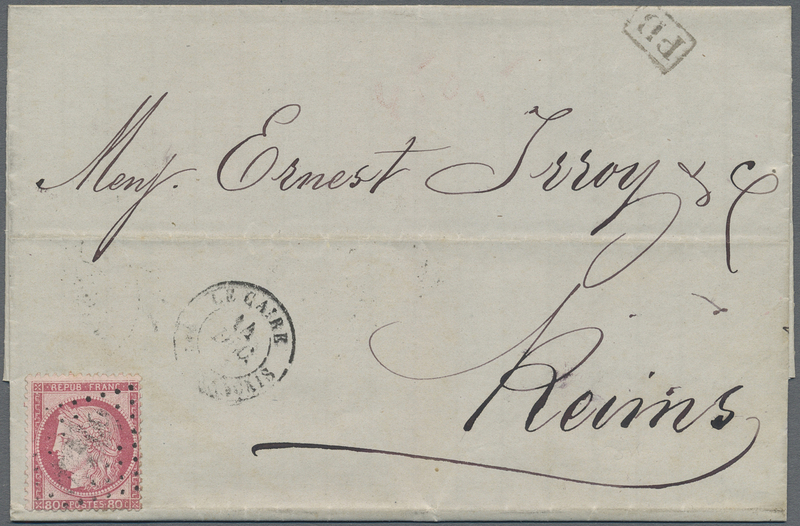 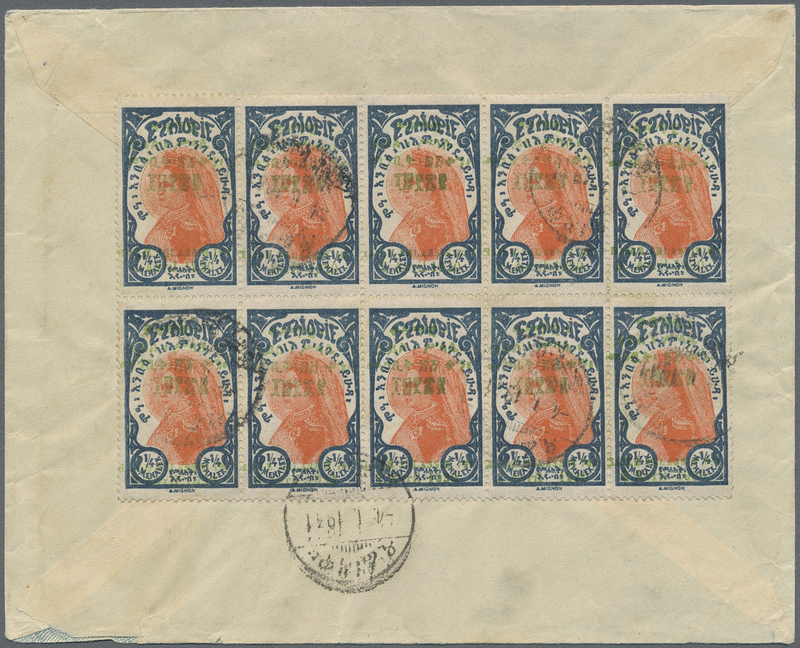 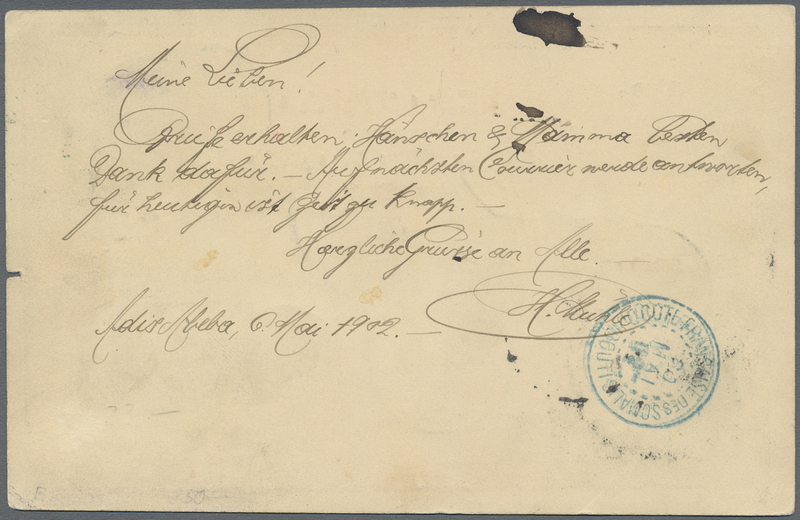 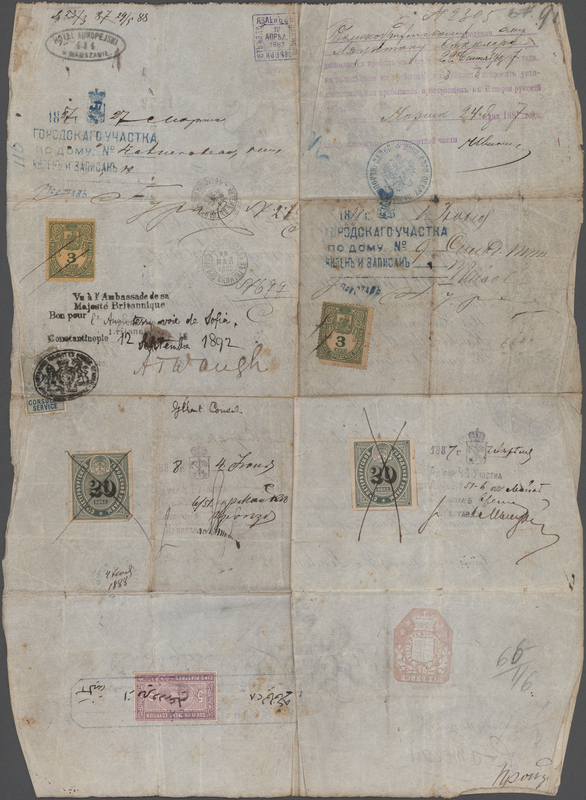 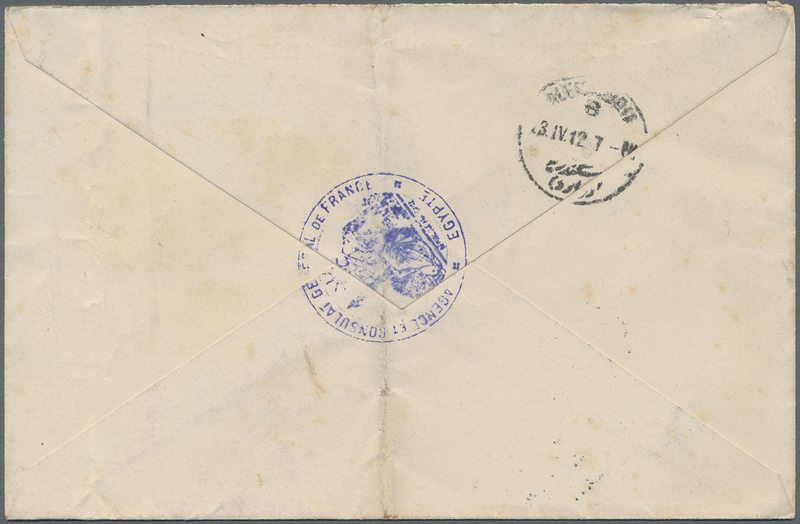 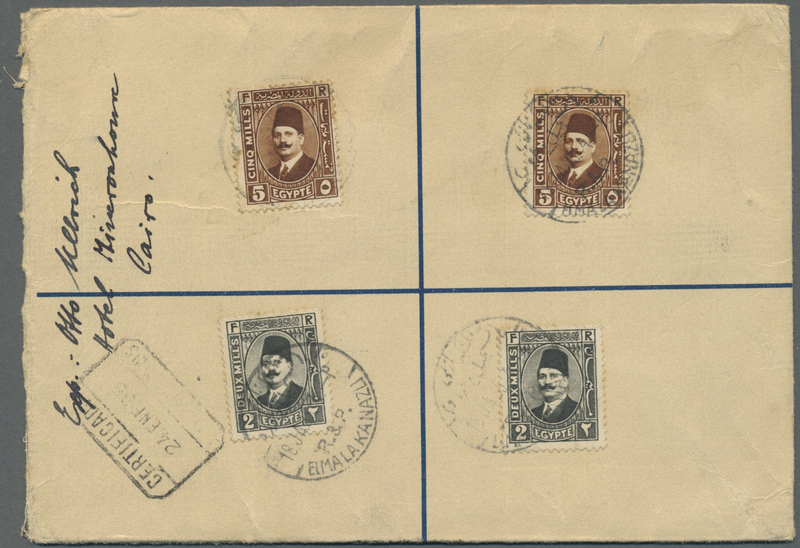 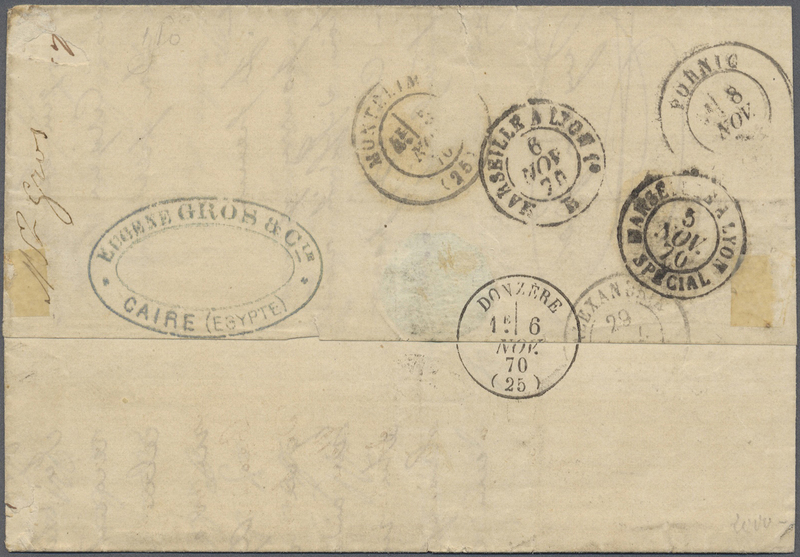 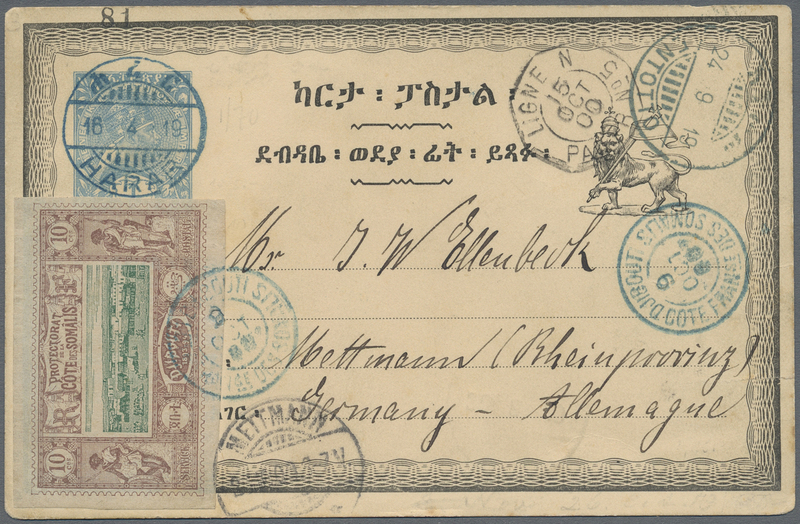 used REGISTERED from Cairo to Stettin, Germany and upgraded by 1884 1pi. 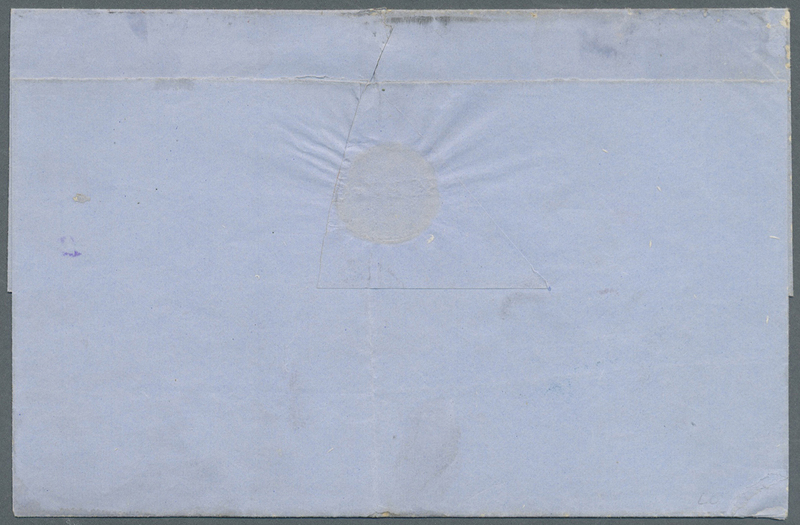 ultramarine, cancelled "CAIRE/4.VII.99" cds, Reg. 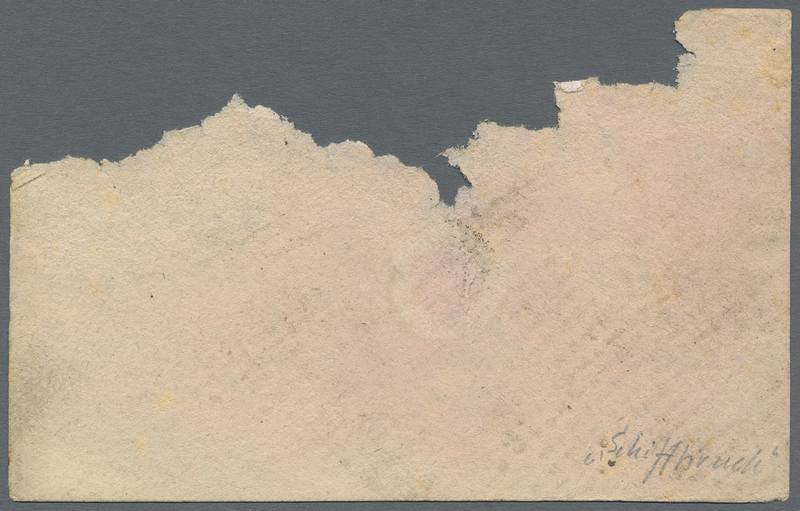 cachet and Stettin '11.7.99' arrival cds alongside, slightly creased bottom right corner and lightly toned at right but still fine. 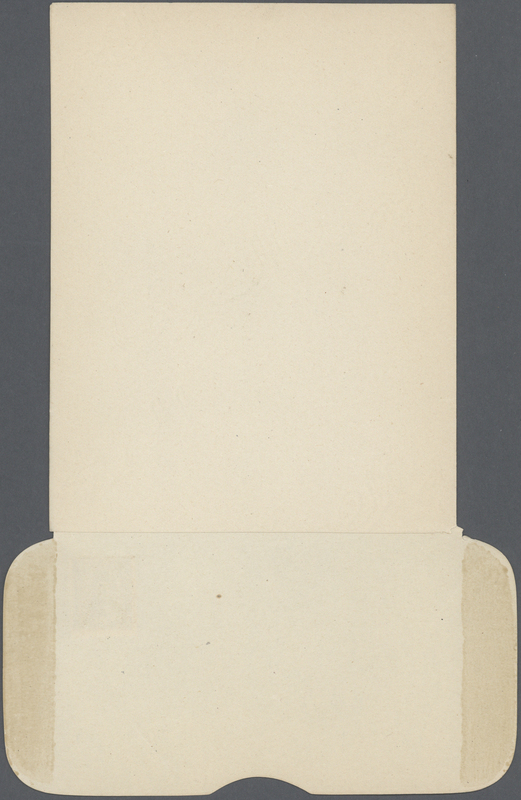 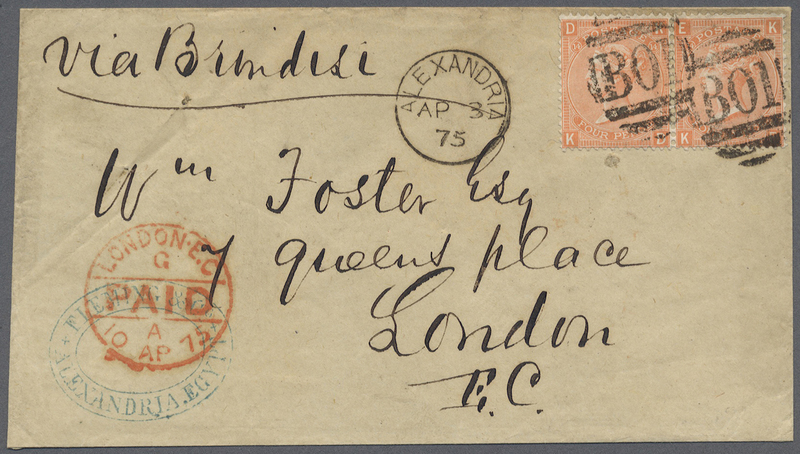 A scarce registered use of a p/s card. 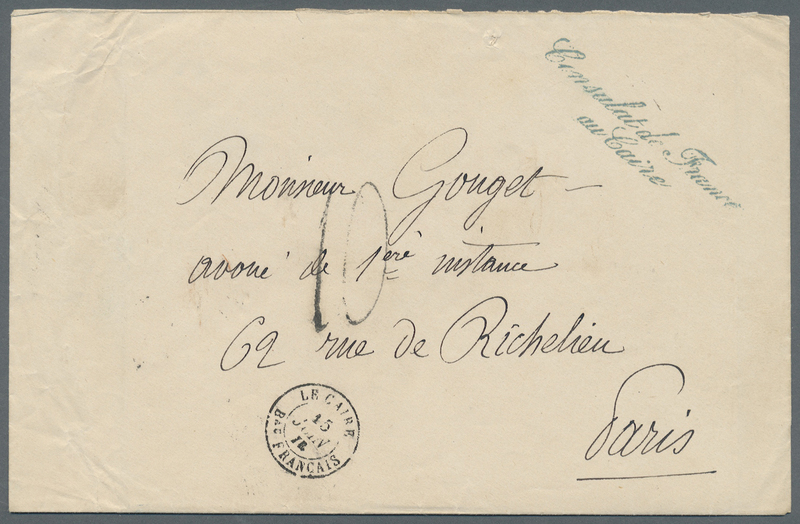 11176 Ganzsache (Complete) 1913 Postal stationery registered envelope 10m. 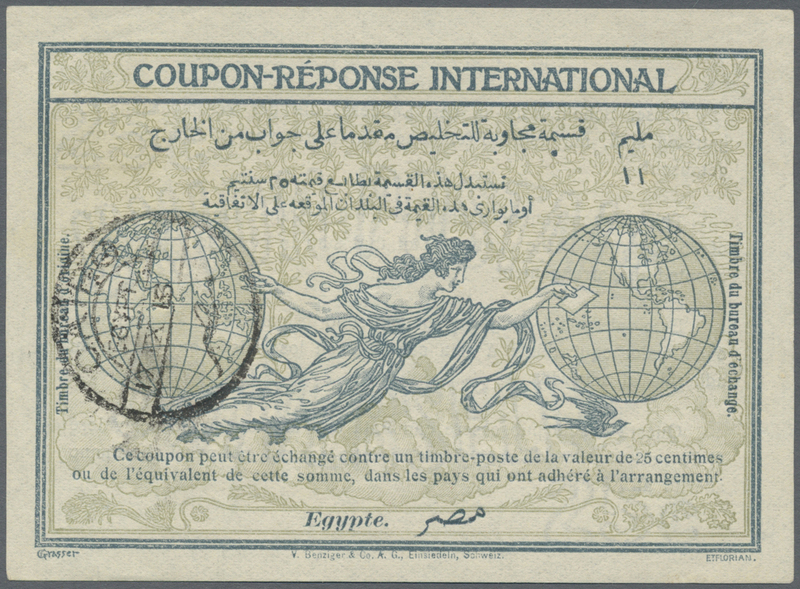 blue uprated Pictorial 5m. 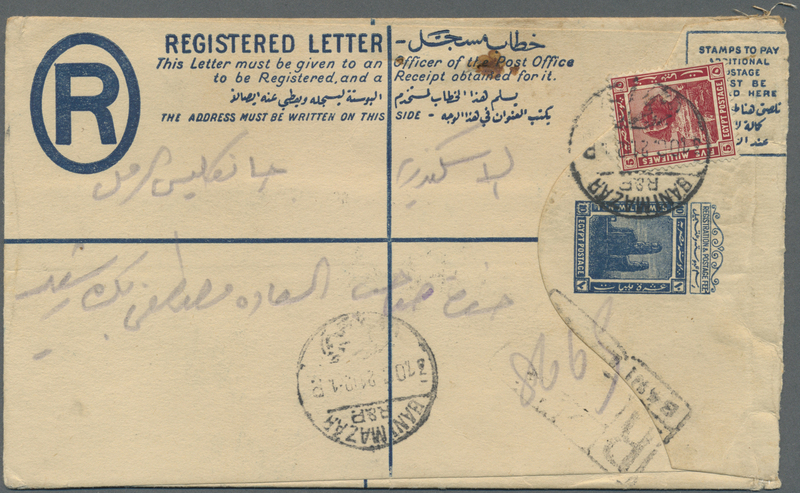 and used inland from Bani Mazar to Alexandria in 1921, cancelled by "BANI MAZAR/R & P./31 OC 21" cds, Bani Mazar Reg. 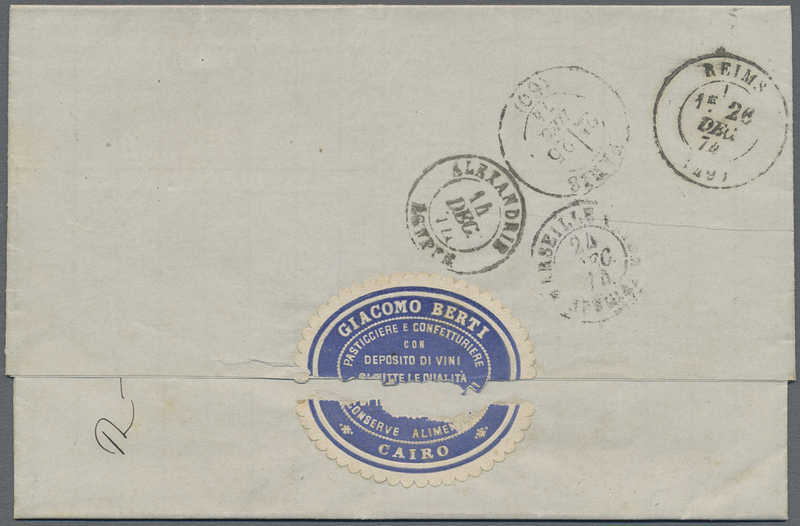 cachet alongside, and on the reverse with 'San Stefano R & P.' transit cds as well as Alexandria arrival datestamps, with traces from a rusty staple at top otherwise fine. 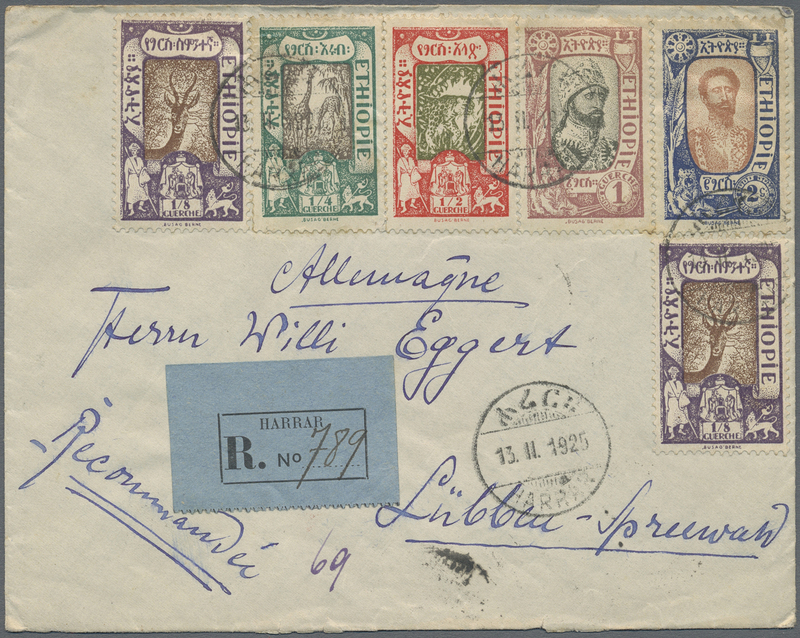 11178 Ganzsache (Complete) H&G 21 1918 CRASH MAIL: Postal stationery card 4m. 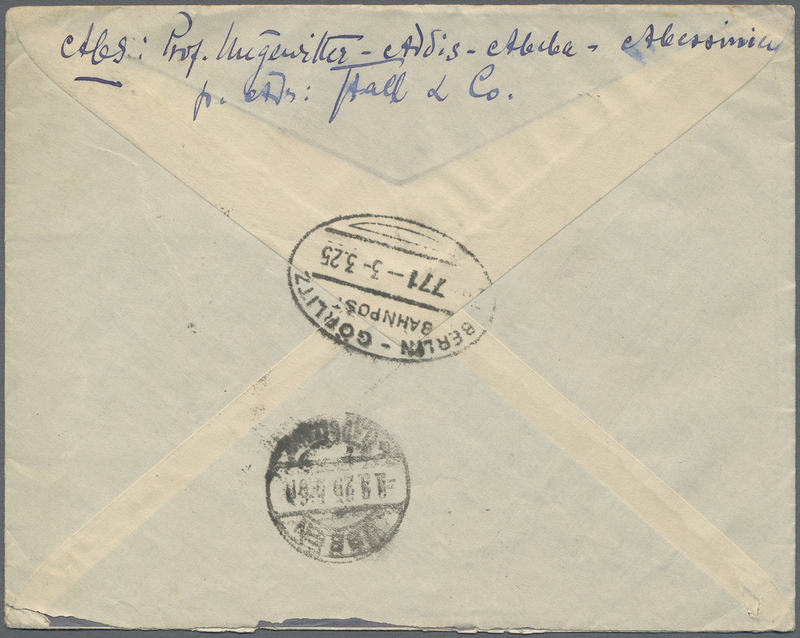 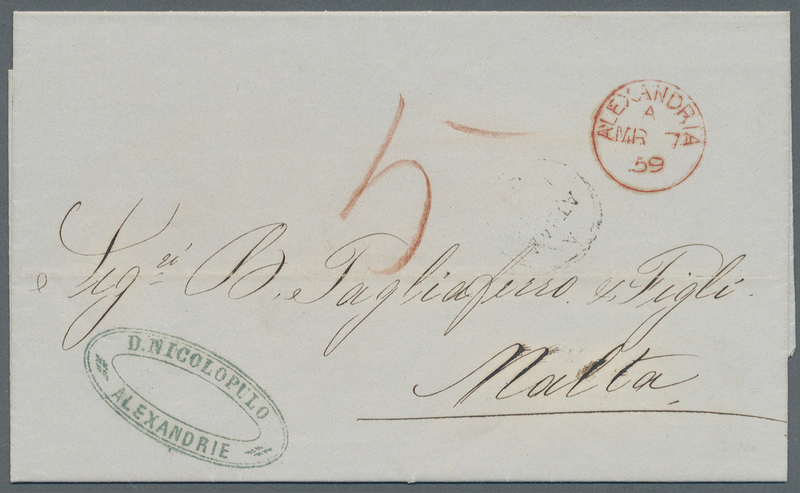 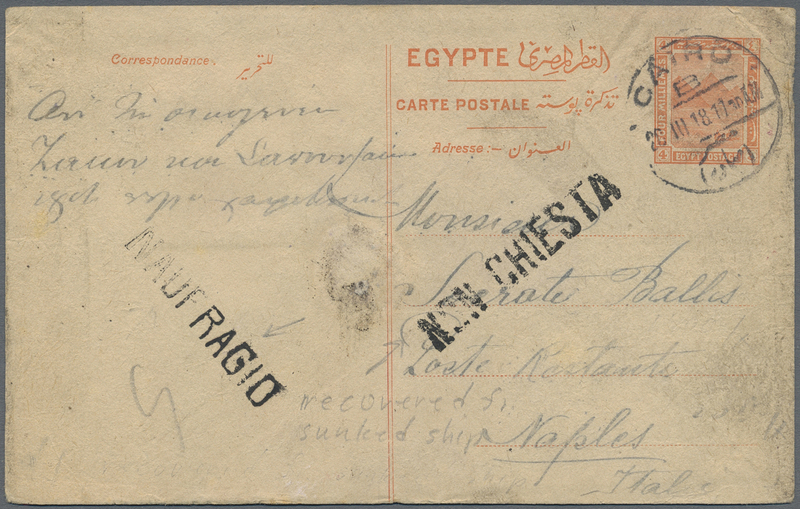 red used from Cairo to Naples, Italia carried by a ship that sank and recovered, with Italian handstamps "NAUFRAGIO" (shipwreck) and "NON CHIESTA", damed by sea water but A SCARCE POSTAL STATIONERY CARD RECOVERED. 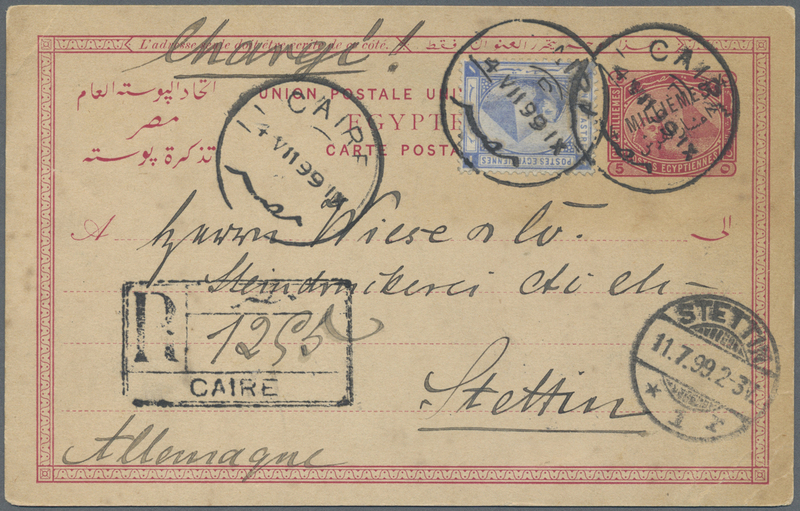 11179 Ganzsache (Complete) 1930 Postal stationery registered envelope King Farouk 15c. 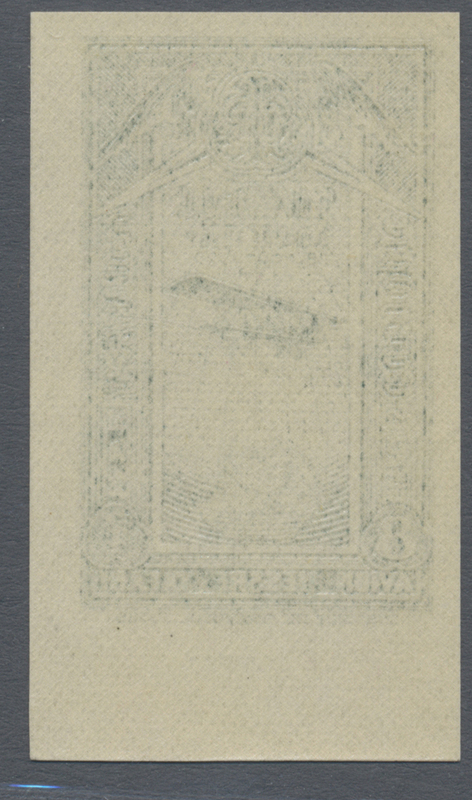 blue uprated 1929 50m. 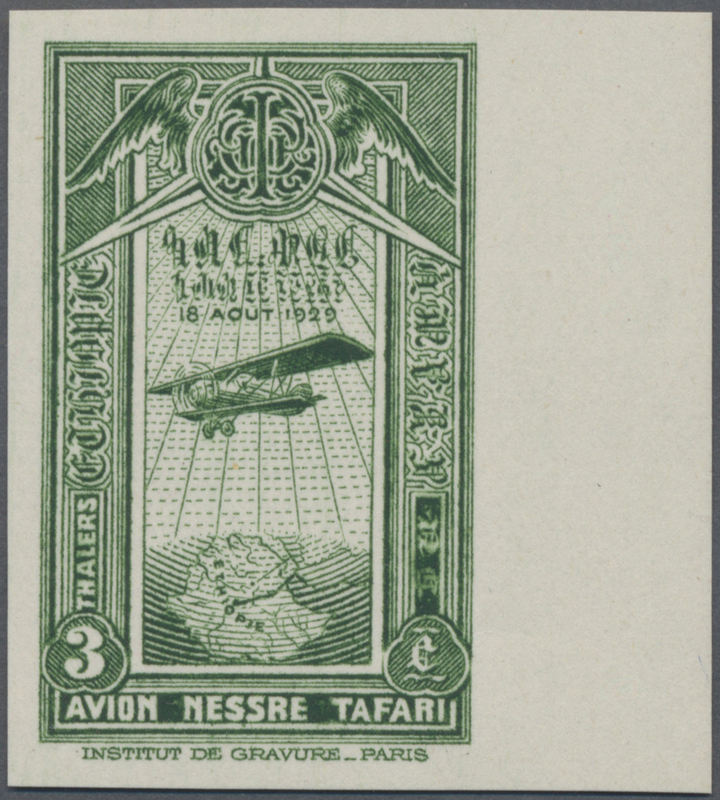 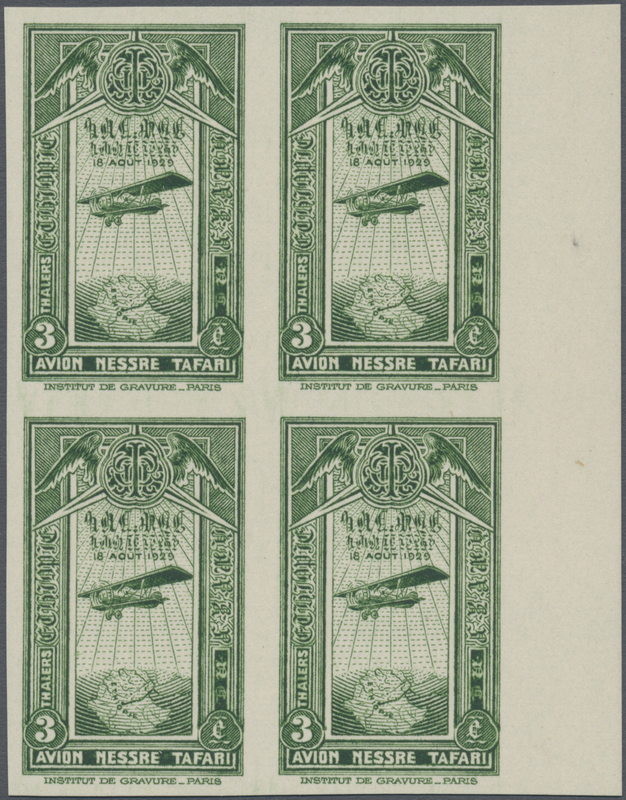 blue-green (front) and even two singles of 5m. 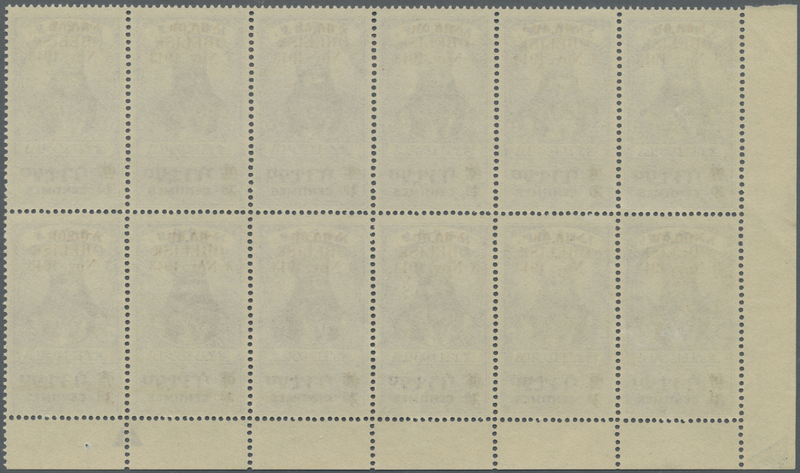 and 2m. 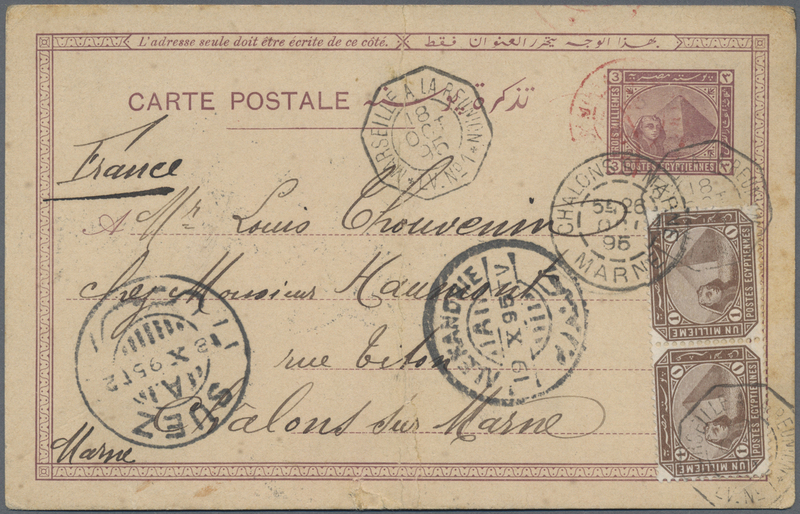 (on back), used from Elmala Kanazu to SPAIN, cancelled by bilingual "ELMALA KANAZU/R. 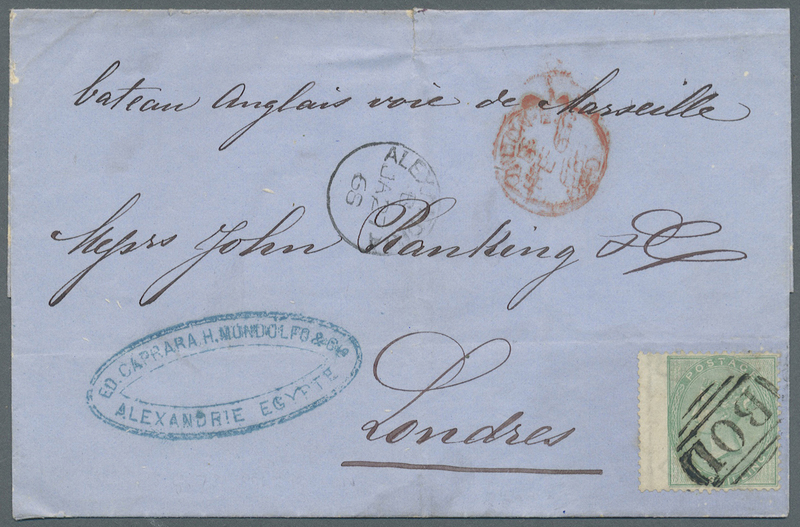 & P./18 JA 35" cds, scarce general Reg. 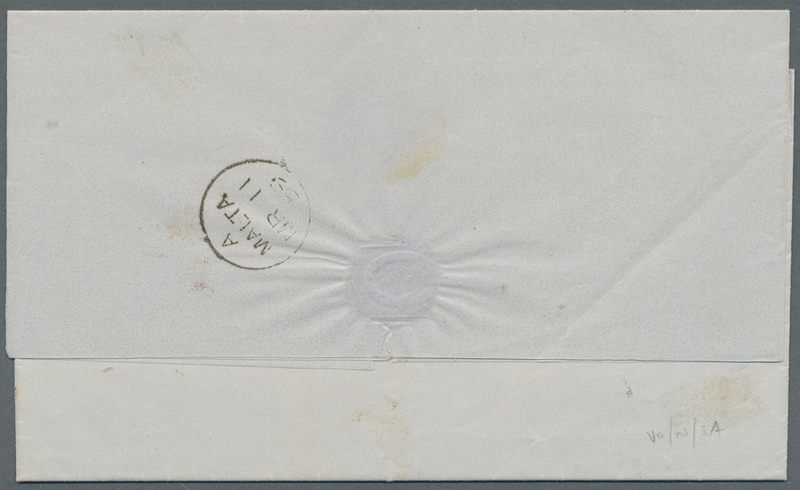 label on front, '24. 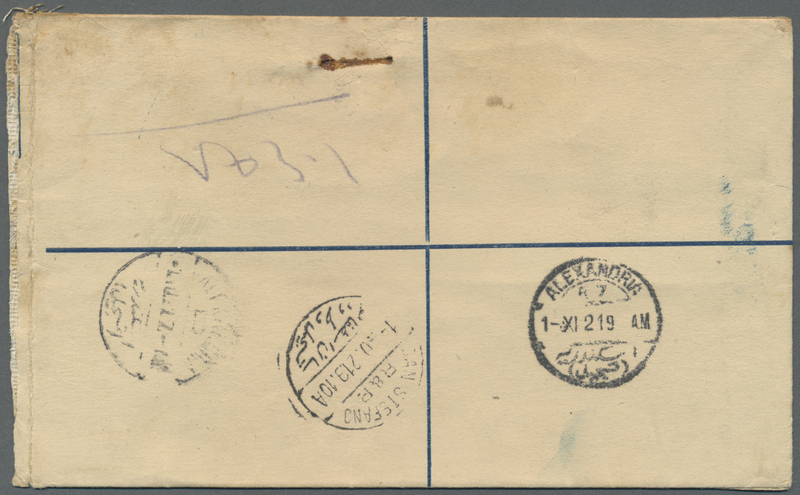 Jan. 35' arrival datestamp on the reverse, fine. 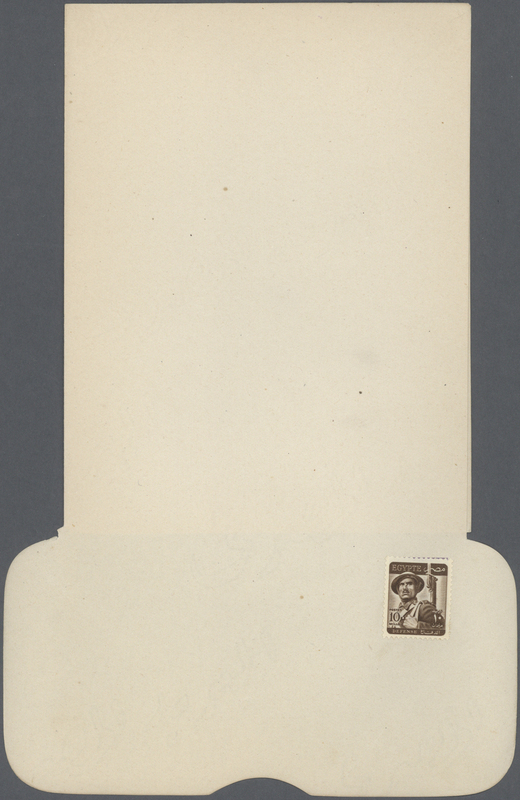 11180 Ganzsache (Complete) 1953 Postal stationery letter sheet 10m. 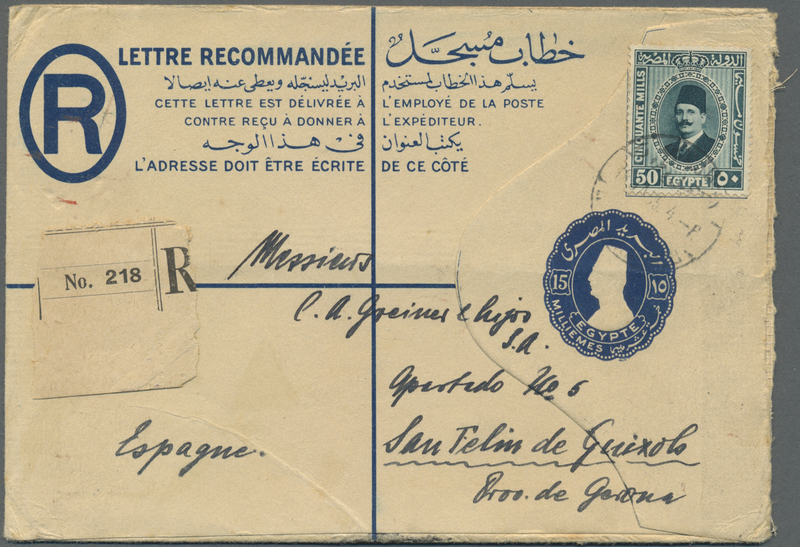 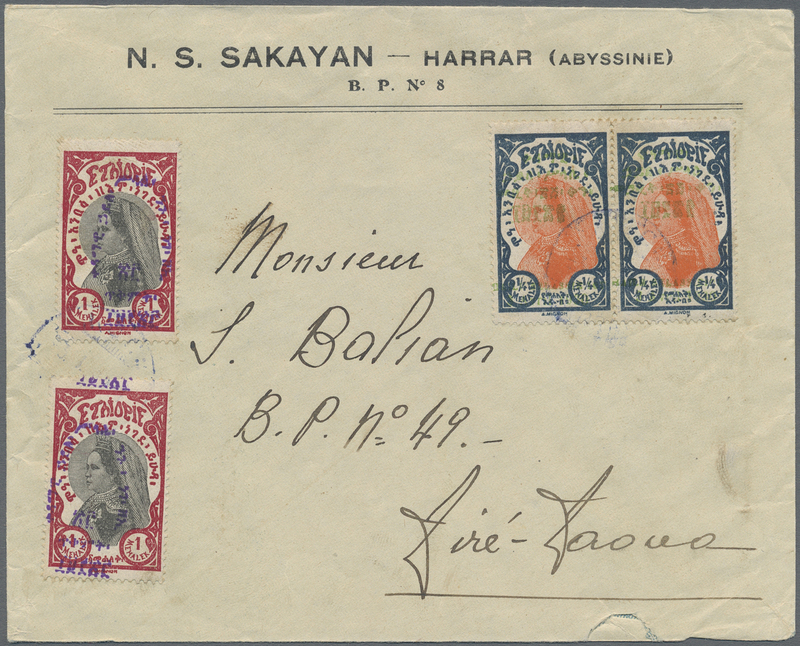 'Soldier' postage stamp affixed over King Farouk's Crossed vignette with a large "X", fine unused and unfolded. 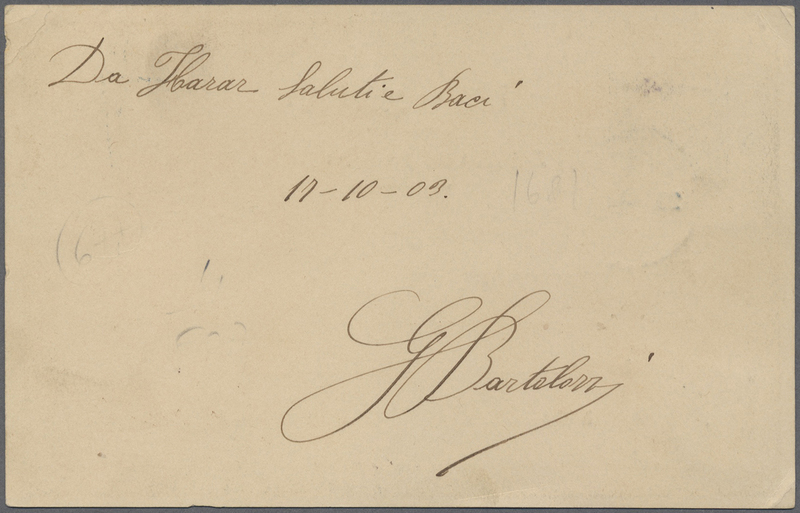 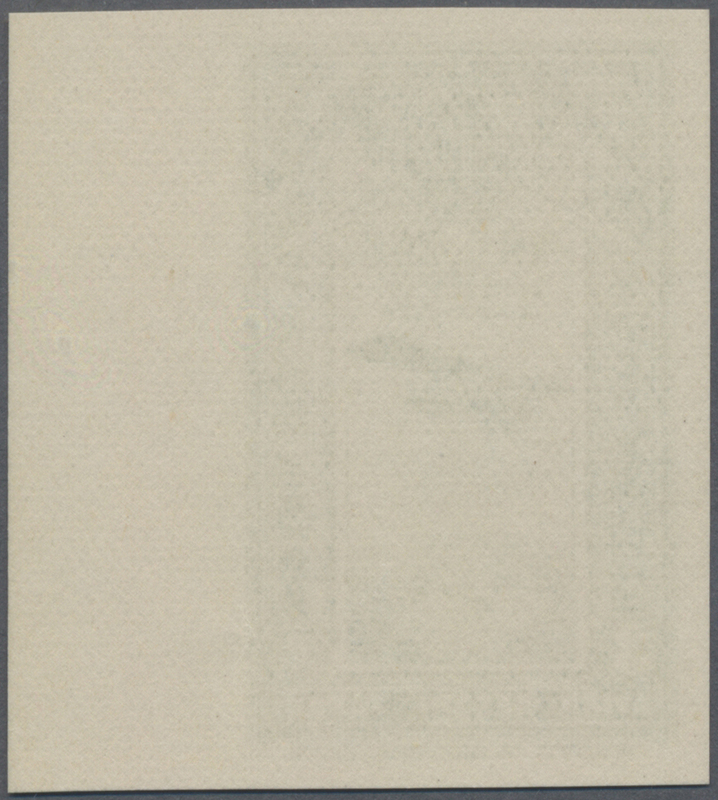 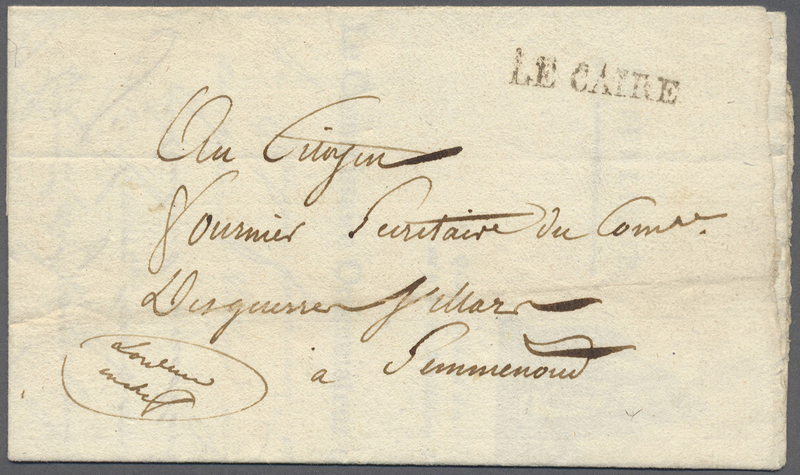 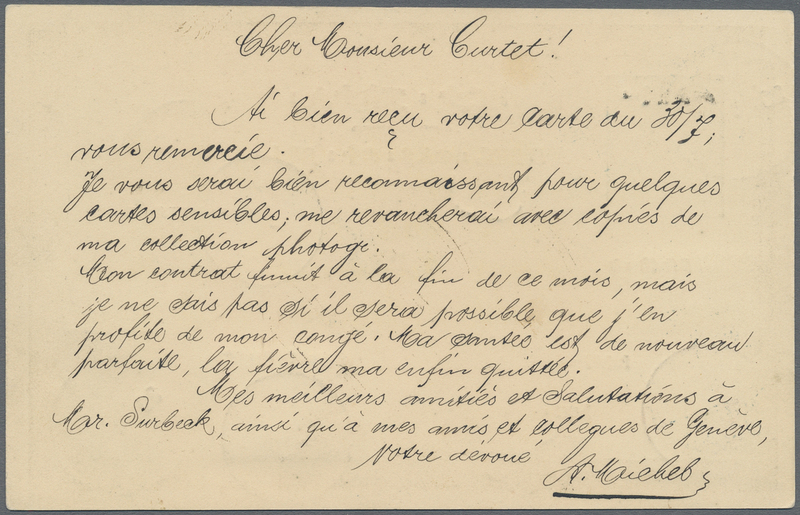 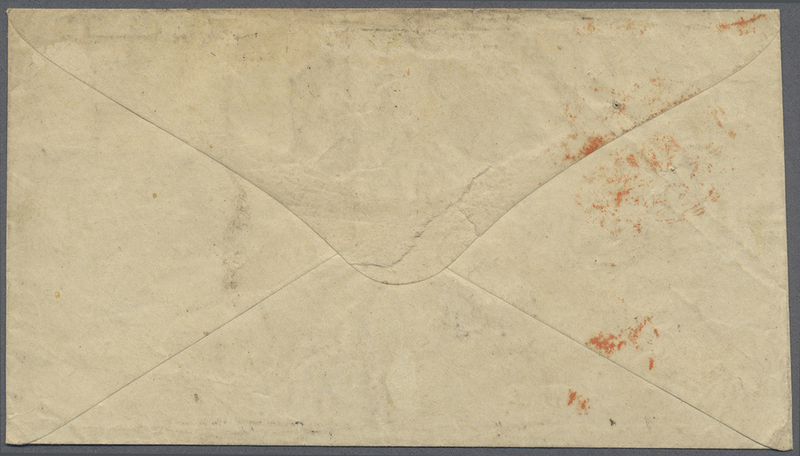 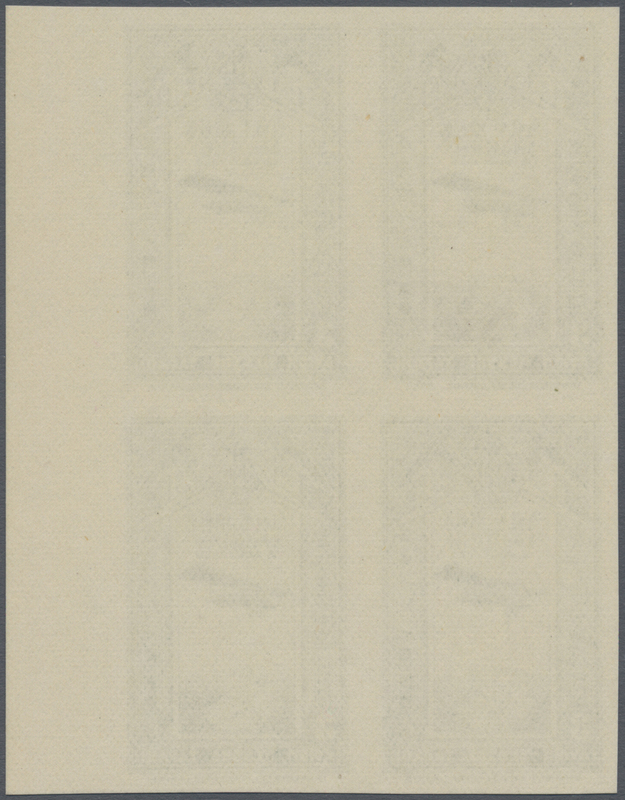 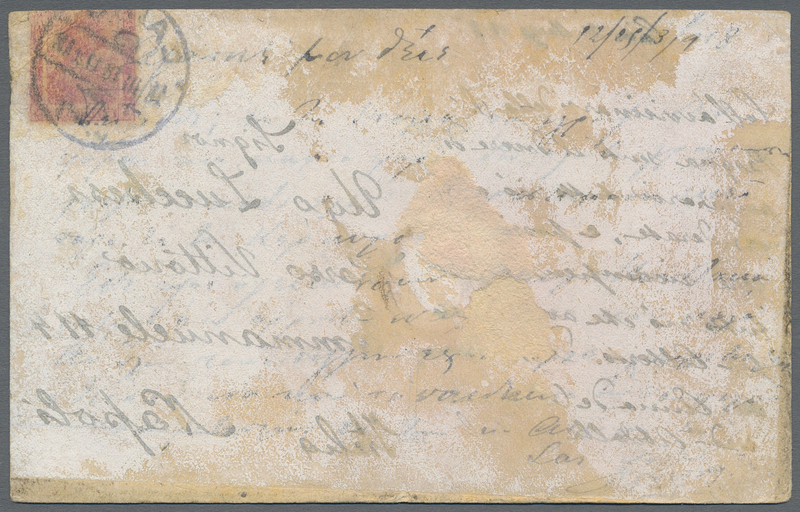 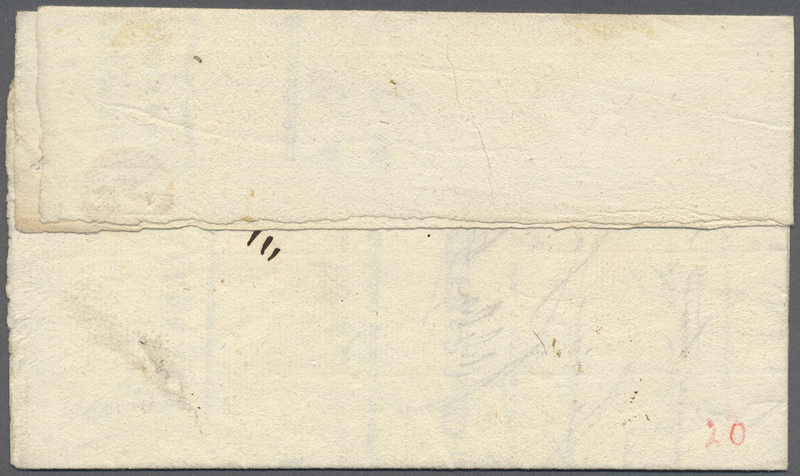 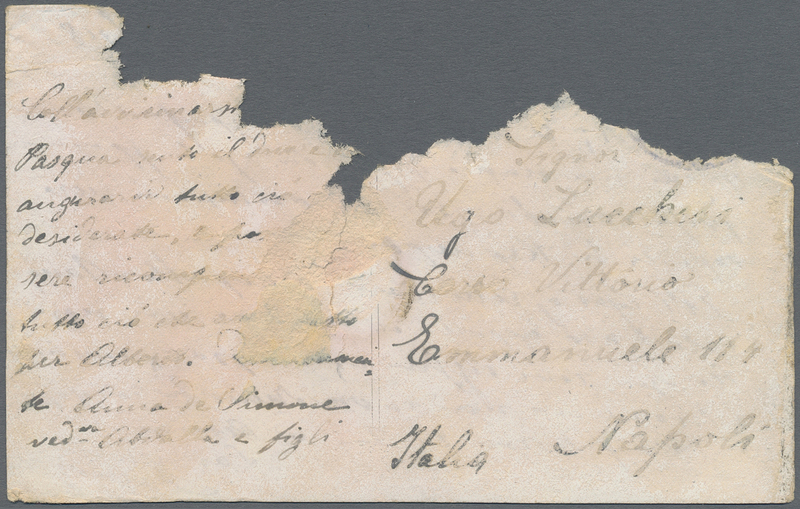 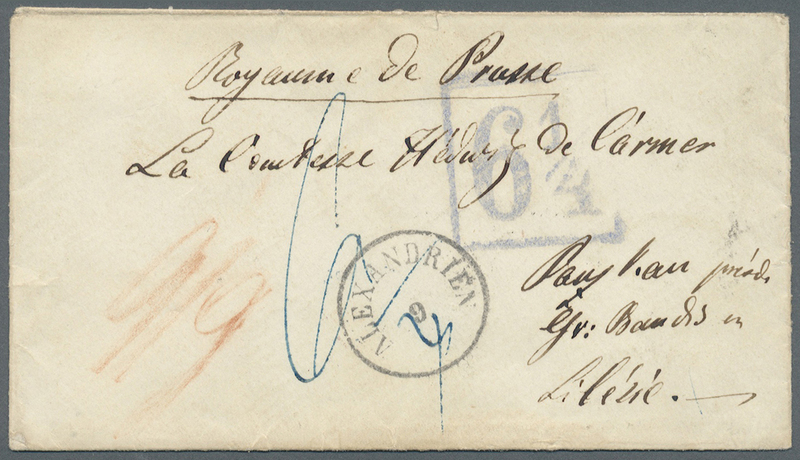 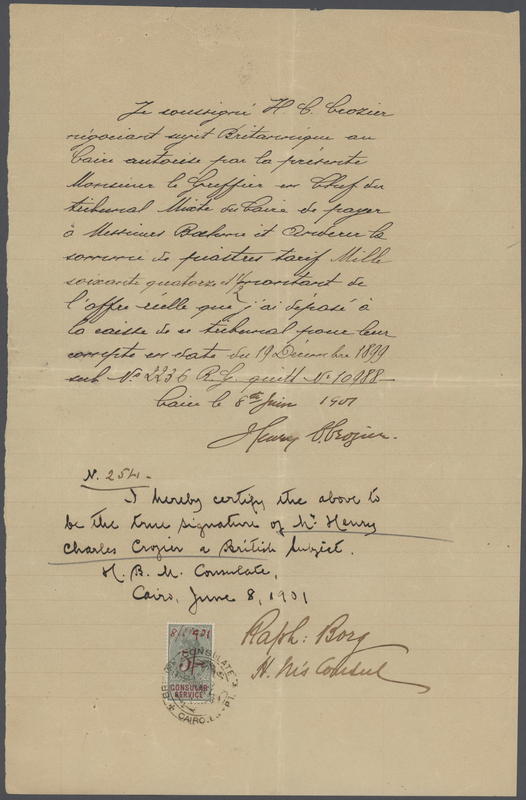 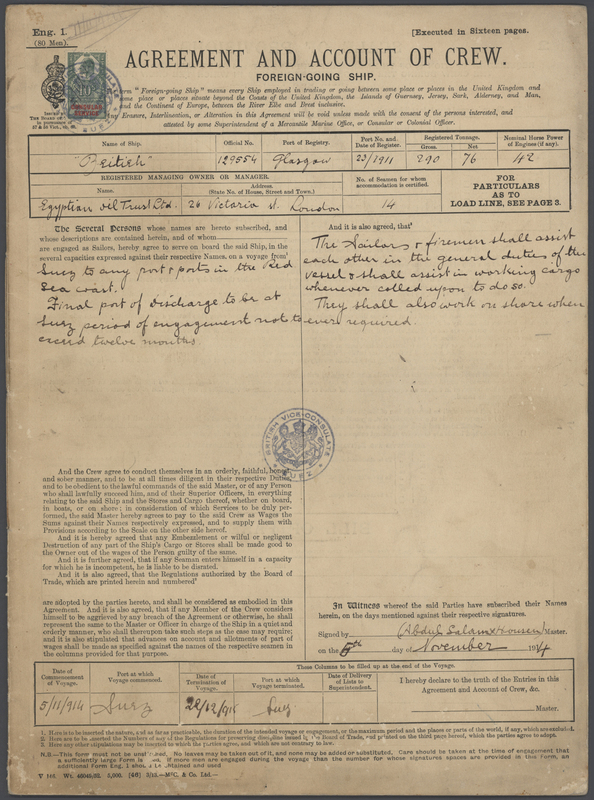 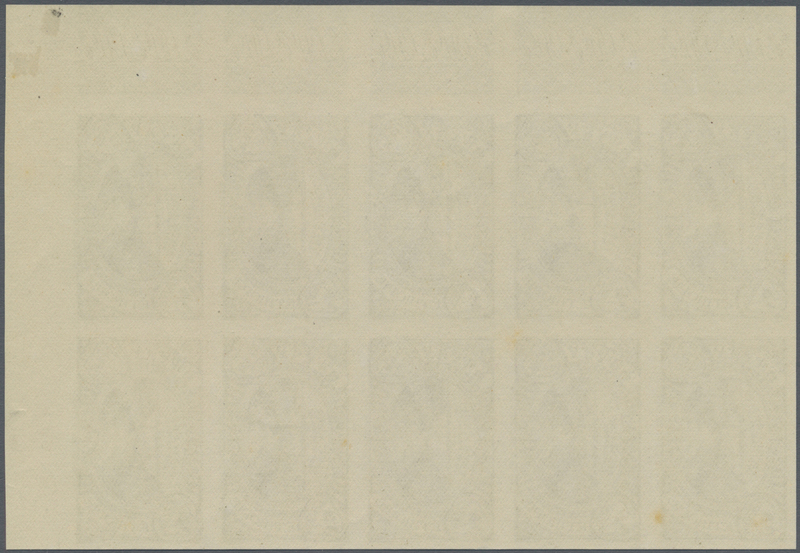 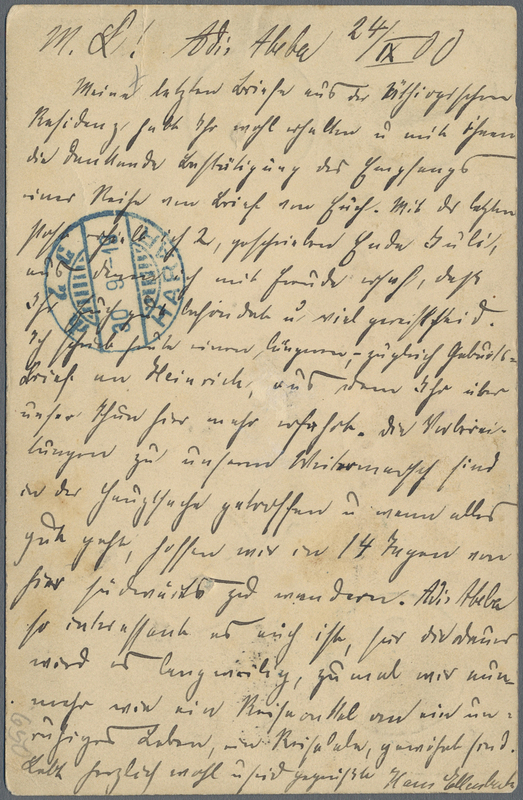 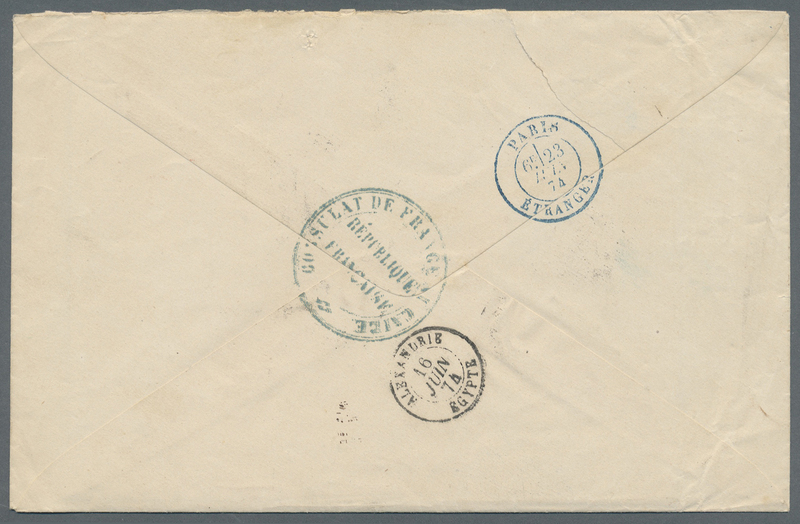 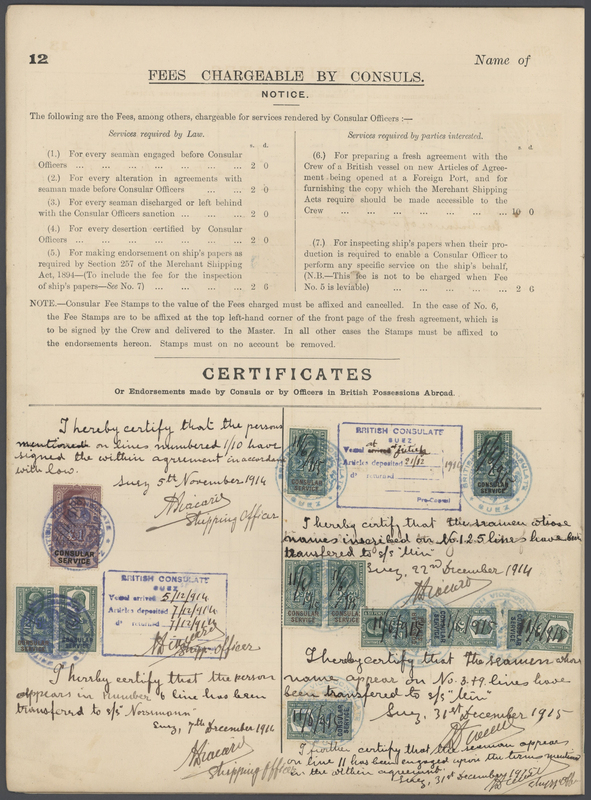 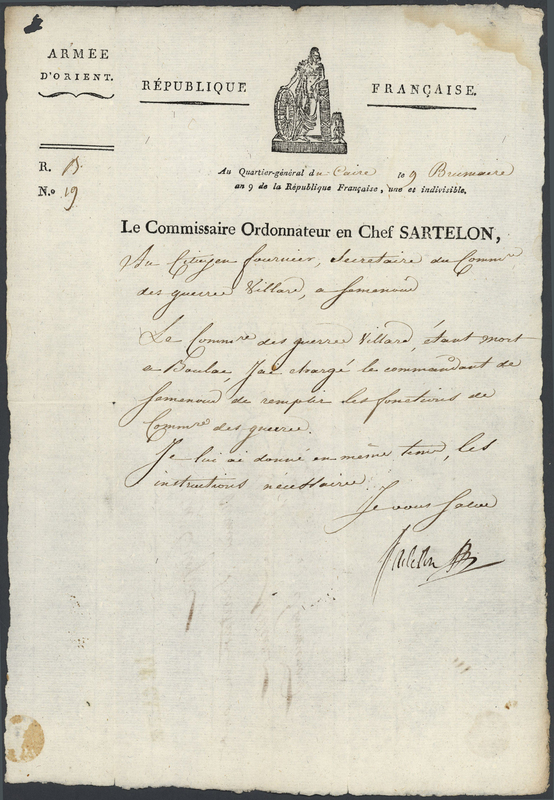 A scarce letter sheet. 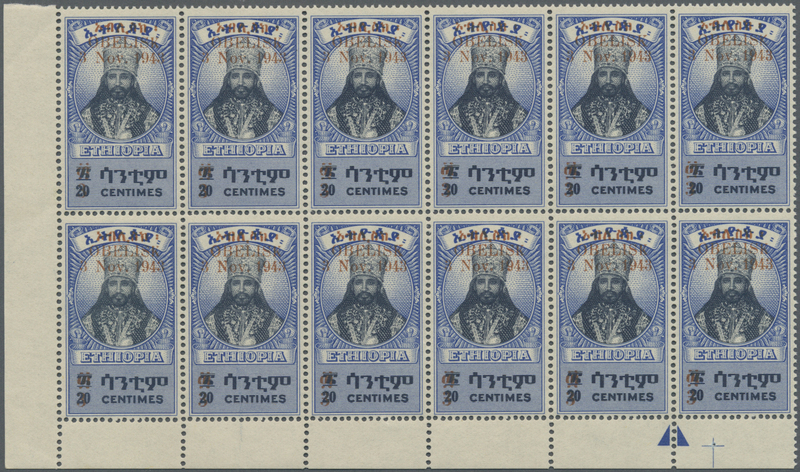 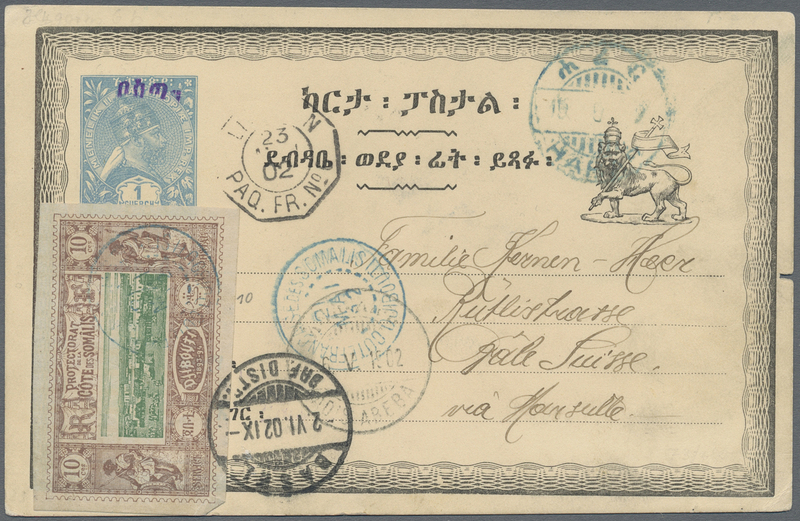 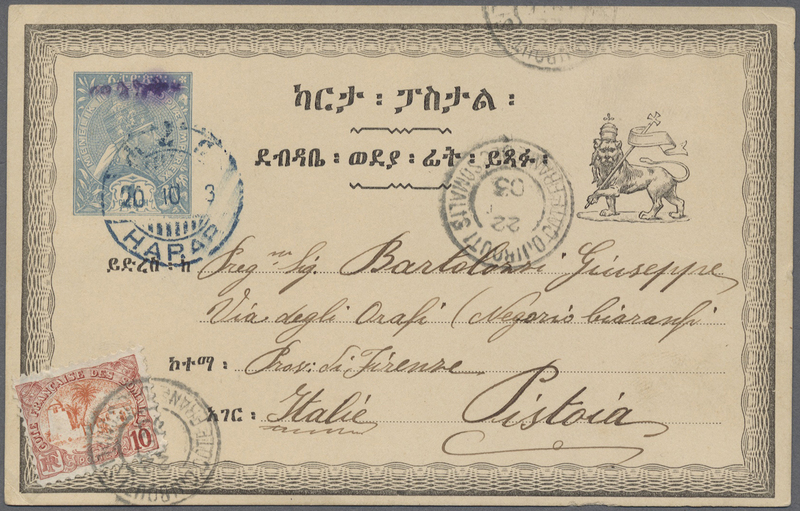 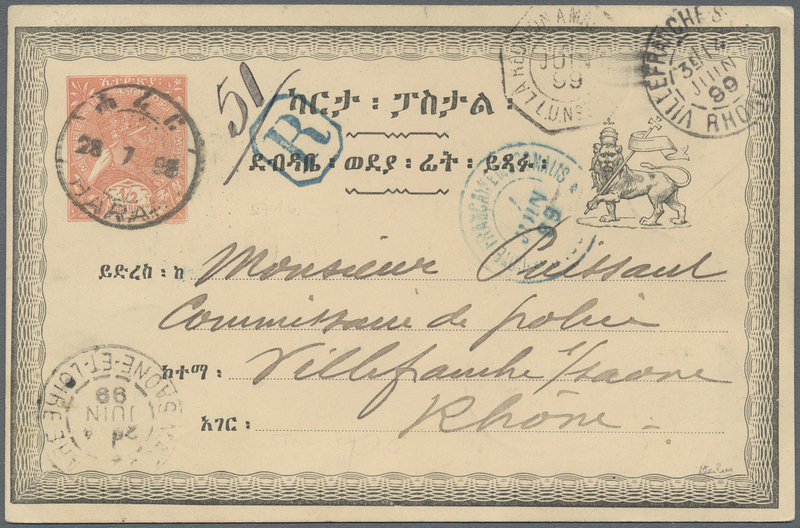 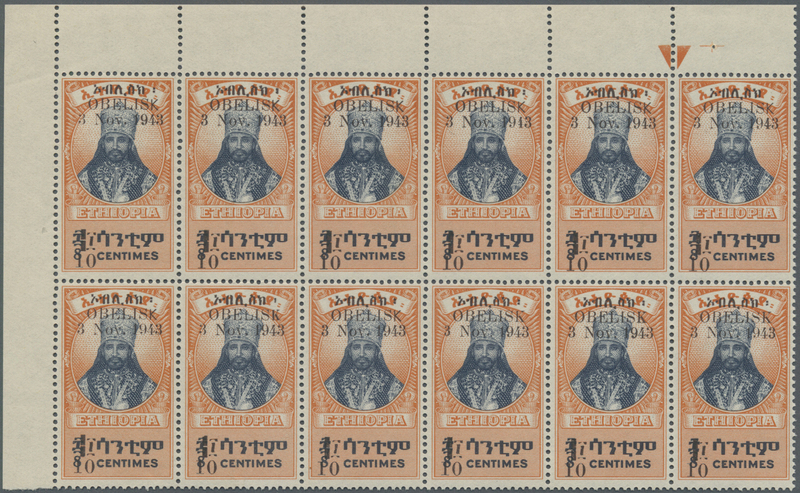 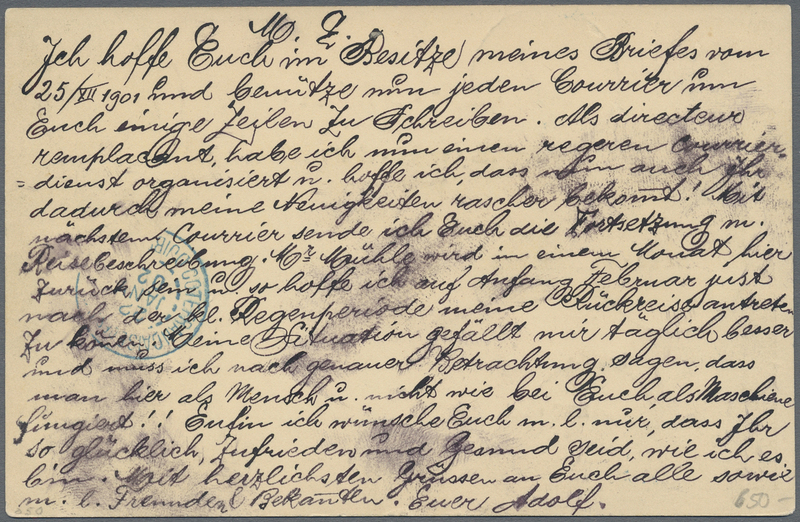 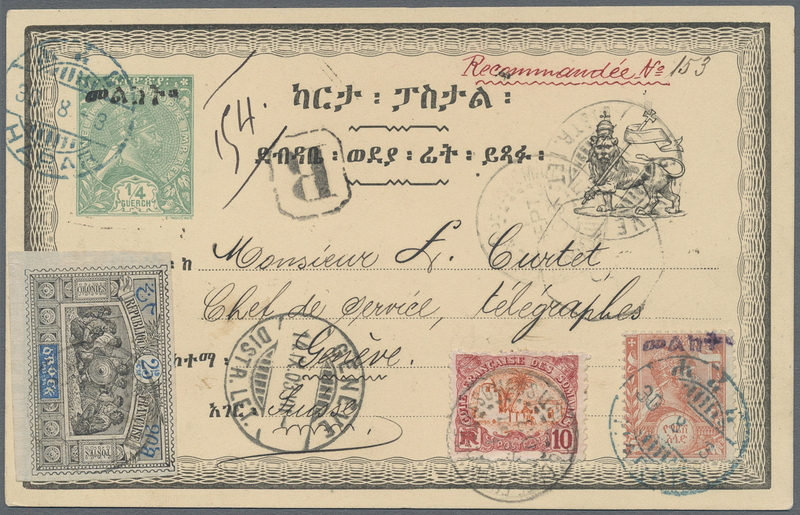 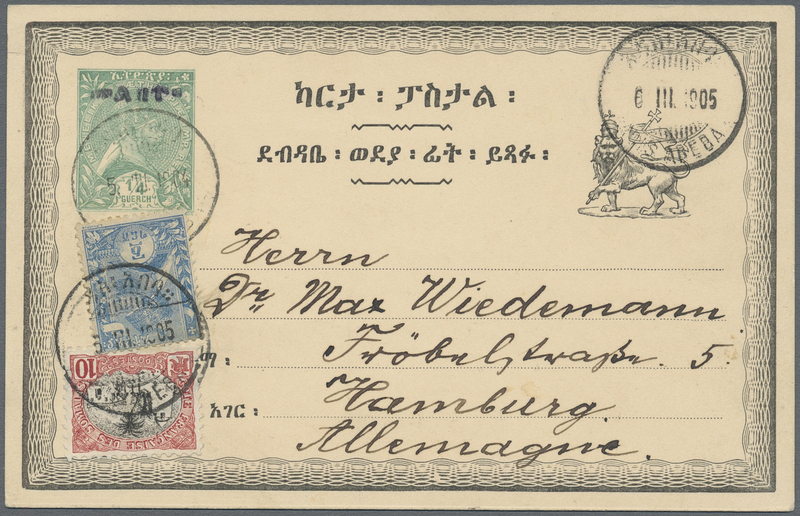 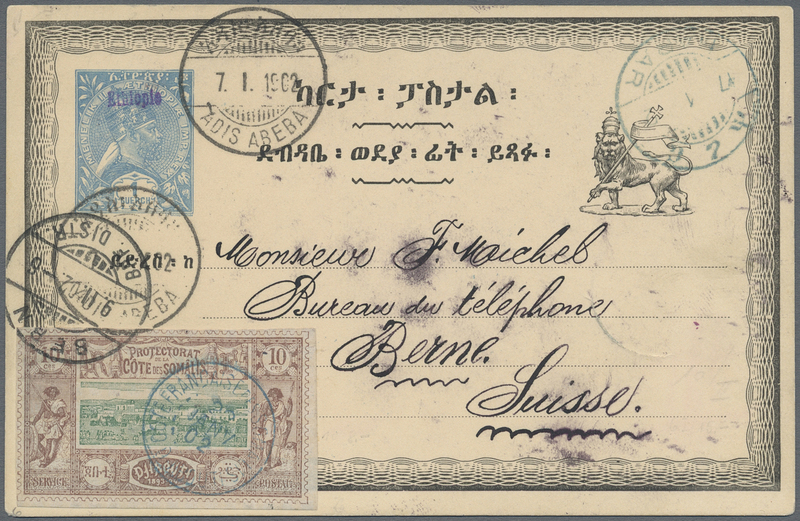 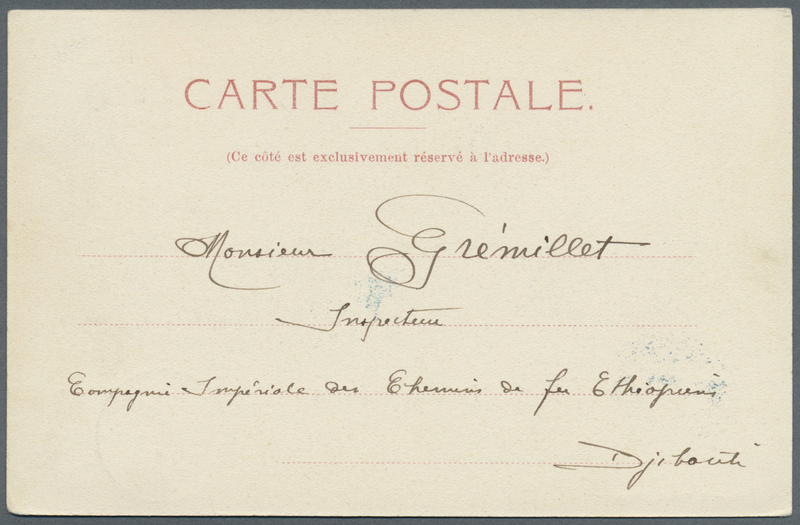 11200 Ganzsache (Complete) 1902, 1 G blue "Menelik" postal stationery card with amharic ovp "malekt" in violet, uprated with French Somali Coast 10 C definitive (MiNr.41) and Obock 25 C "allegory" (MiNr.31), sent registered from HARAR via transit Djibouti to Paris in France. 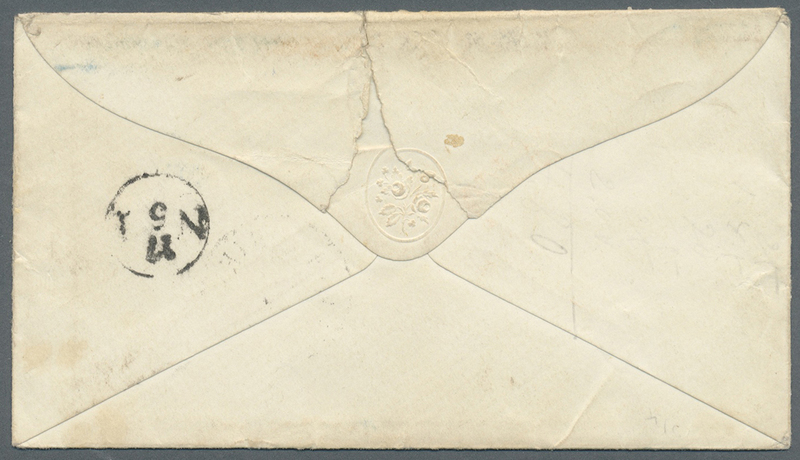 Very rare franking combination! 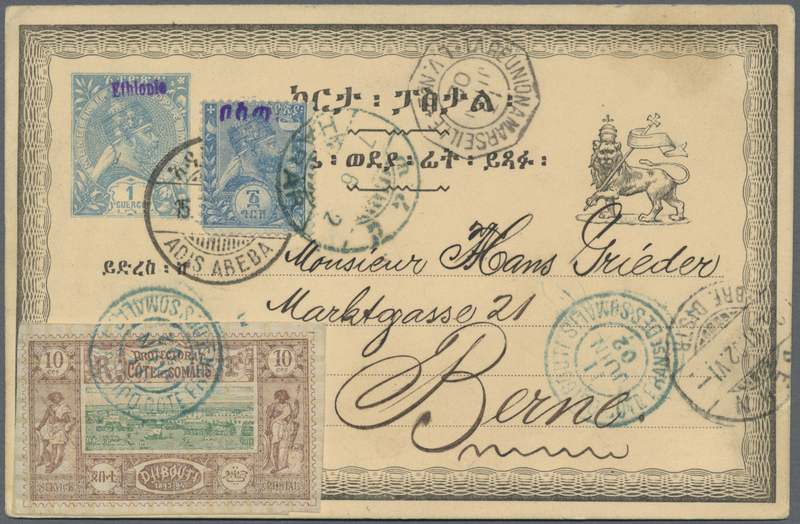 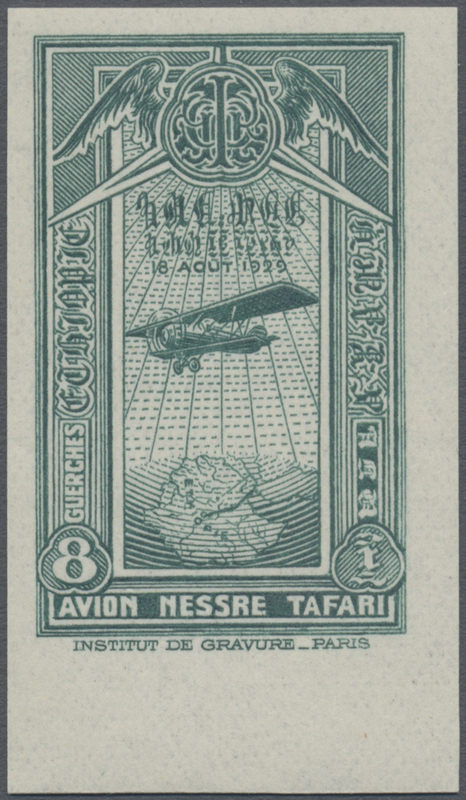 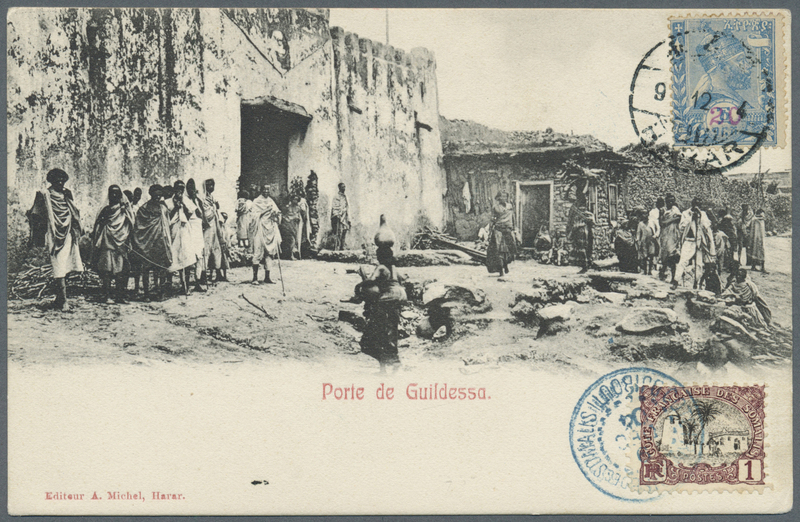 ÷ 1903, 1 Guerch-Ganzsache mit Zudruck von Harar mit 25 C. Obock (MiNr.31) und 10 C. Somaliküste (MiNr.41) mit Durchgangsstempeln als R-Karte Nr. 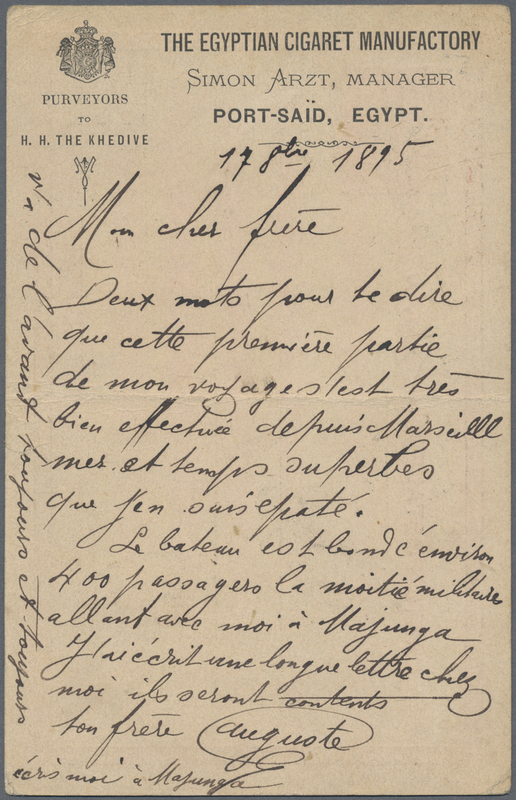 87 nach Paris in Frankreich, interessante Frankaturkombination !